The UK’s Secretary of State for Transport has approved a 4.5km extension of the Gospel Oak to Barking line. The line, which is currently being electrified, will be extended south east from Barking station to the new Barking Riverside housing development. The Secretary of State, Chris Grayling, has now given his support to the project – approving the Transport and Works Act Order (TWAO) for the extension. The extension will initially follow the route of the existing Essex Thameside Tilbury line. 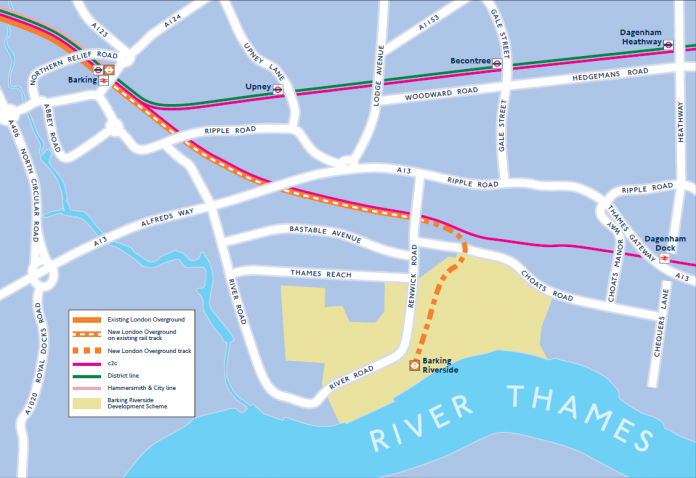 TfL said the Barking Riverside extension replaces previous plans to extend the Docklands Light Railway (DLR) to Dagenham Dock via Barking Riverside. The line may well be extended further south in the future, TfL has said. Work is expected to begin later this year, with the extension opening in 2021. Great news. The people of Barking Riverside will have their journeys improved and won’t need to take the bus to Barking station for District, Hammersmith & City lines and C2C services. Once the London Overground extension to Barking Riverside is finished and completed (plus with the electrification between Gospel Oak and Barking is also completed) along with new Class 710’s. There could be plans to extend the DLR from Gallions Reach to Dagenham Dock which will have a new station at Barking Riverside to interchange with London Overground. Plus there could also be plans to extend the DLR or London Overground to Abbey Wood so it can connect with the Elizabeth Line and Southeastern services.